Passionate--formerly Moderate--now Liberal "Mormon": In which Marc Simmons and the Utah State Historical Society Come through for me. In which Marc Simmons and the Utah State Historical Society Come through for me. Marc Simmons is a great guy and one of many interesting characters in New Mexico. I think per capita, New Mexico may outdo California, New York and even Utah for its eccentric characters. Simmons is a great popular historian who writes to explain things to regular people rather than impress the academic crowd. He lives fairly close to Santa Fe but rather far in an "off-the-grid" sort of way. At least when I had my minimal contacts a few years ago, he had no electricity, computer (a manual typewriter kind of a guy) or even a phone. He picked up his mail at the newspaper office in Santa Fe, where I had left my letter, and with no moral aversions to the telephone (he just preferred not to have one) he gave me a call when he was in town. The Battalion followed an old Spanish trail from Agua Fria to the Rio Grande River [why do people say "Rio Grande River?" Don't they know they're saying "Big River River?" Sorry.] near the San Felipe Pueblo. Cooke would not lead the Battalion from Agua Fria directly to the Rio Grande, because the steep cliffs dropping from the La Bajada Mesa were impossible for wagons to negotiate. Instead they followed the wagon road, approximately present State Route 10 [Highway 14 or "The Turquoise Trail"], south from Agua Fria toward Cerrillos. Their camp was at the "last water" north of the Galisteo River which almost certainly would have been the San Marcos Arroyo where both water and grass were available. On October 21  the march covered a grueling twenty-four miles. The Battalion reached the Galisteo River about 11 a.m. and followed the riverbed about seven miles to an unnamed arroyo immediately southwest of the present Galisteo Dam. 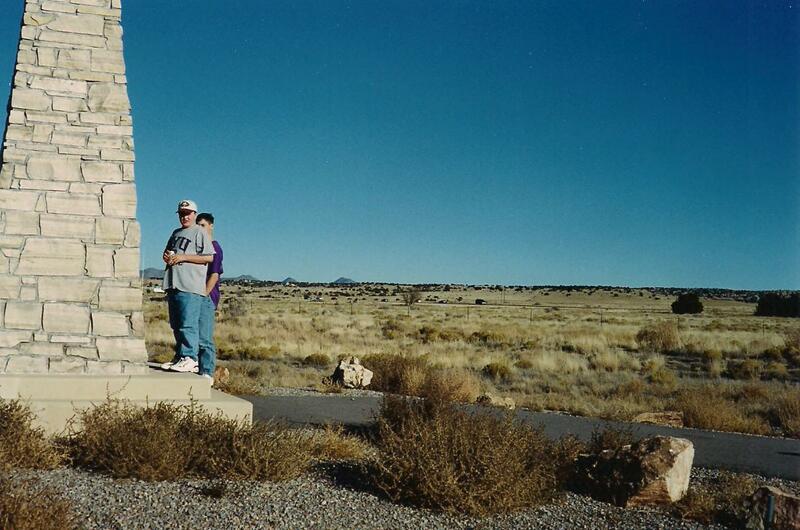 They proceeded over relatively level land, crossed the site of present Route 85 [I-25] at the Mormon Battalion marker constructed by the Utah Trails and Landmarks Association and continued westward until entering the Rio Grande Valley just south of the Arroyo de la Vega de los Tanos. They camped about two miles north of San Felipe Pueblo. It finally gave me a pretty clear explanation along with a clearer picture with maps. It is interesting though, even going back only to 1972, the modern highway names change and the Battalion Monument referenced, is close, but not in exactly the same spot as it was removed during I-15 construction and replaced and rededicated in 1996, which re-dedication we were able to attend. It is certainly worth a stop off the Budaghers Exit between Albuquerque and Santa Fe. And if you look both ways in the right directions, you can see the trail route (More later). I discussed this route with Marc Simmons and he said that it made sense. He told me about wandering the La Bajada bottoms with a mule exploring all the routes. I sure wish I had notes of that conversation (with me, not with the mule). But now I've recorded at least this much. I had been out several times exploring ways to get off La Bajada Mesa but from the top. That threatened my vertigo a couple of times when I ended looking over that escarpment, once on an apparent overhang. And that was also how we found the road to Waldo, one of my favorite places in New Mexico (more on that in a later posting). And who wouldn't be happy after finally finding Waldo? The big numbers in black are the dates in October 1846 noting where the Battalion camped those nights. The 24-mile day was the one from 20 at San Marcos to 21 at San Felipe. This was great because we were finally on the right track! I knew the route, now I had to actually find in on the ground to walk upon it. That blessing came again by surprise in continued association with BLM when the archaeologist showed me the philospher's stone of La Bajada - an archaeological report. Chas Peterson, a wonderful cowboy-historian. He was on my master's committee in graduate school. Now he lives in St. George. You need to meet him sometime. a great guy and good historian of Utah and the West.